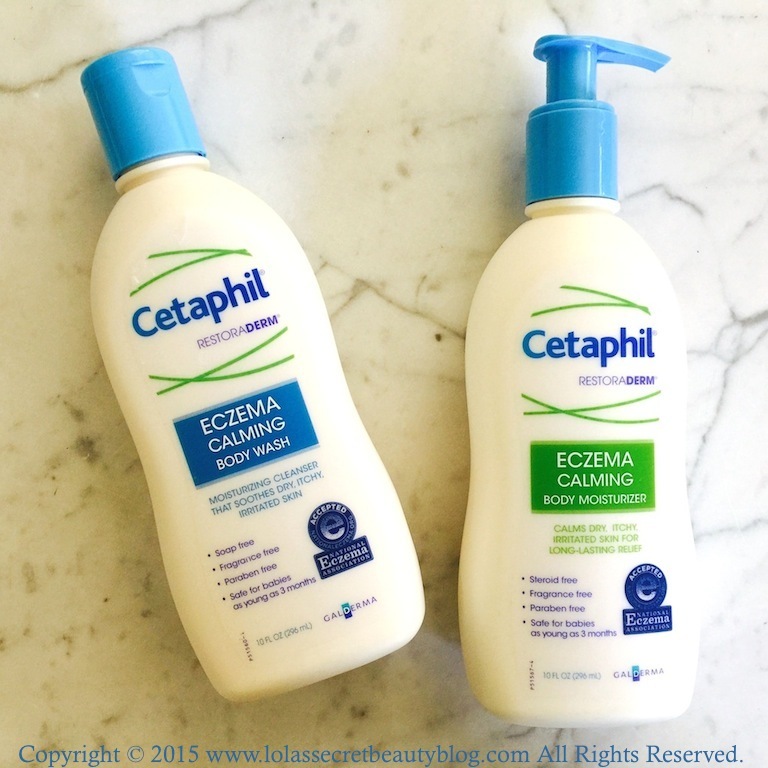 While I neither have Rosacea nor Eczema, I do understand why many who do use Cetaphil products. They are super gentle on even the most irritated skin, they are soothing, and they are fragrance free. 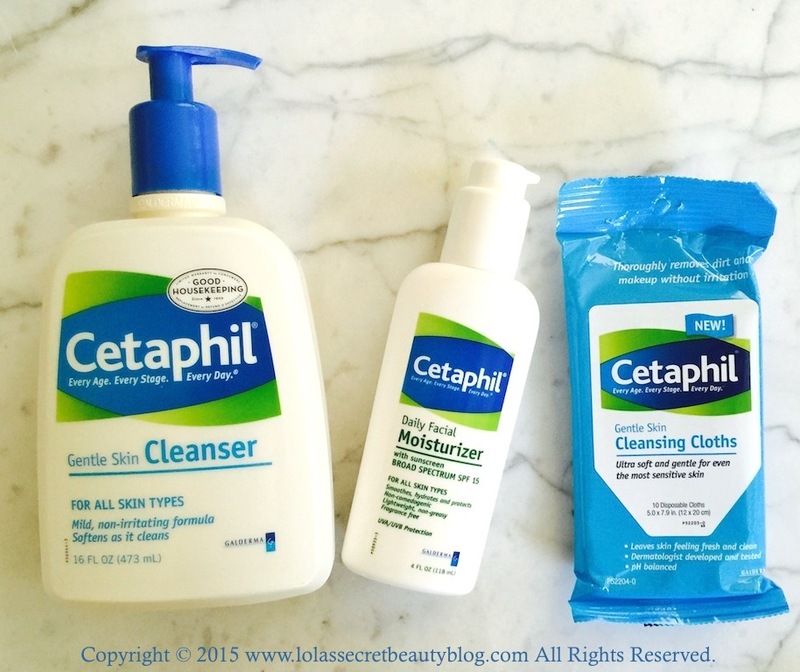 Years ago, my sister and I simultaneously were having issues with sensitive and irritated skin, with the added frustration of some breakouts, and we pulled the plug on all of our high-end department store skincare products and started using Cetaphil Gentle Skin Cleanser and Moisturizing Lotion, and both did wonders for our irritated skin. In fact, these products were instrumental in healing our skin, and since that time I have almost always had a bottle of their cleanser and lotion on hand. Additionally, since I began blogging I have sought refuge in these products when I have had a negative reaction to products that I am testing. 1) Cetaphil Gentle Skin Cleanser (Suggested Retail: $13.99 for 16 oz. from Amazon, Drugstore.com, ULTA, Walgreens and Target): This is the very cleanser that I began using years ago, and it remains a staple when my skin needs a break after a product skin reaction. It is a lightweight, non-foaming, gel that effortlessly sweeps away dirt, cleans thoroughly and never strips the skin. It feels soothing, and my skin always feels hydrated and balanced afterward. • As gentle as it gets — soothes and cleanses, leaving skin smooth and soft. • Mild, soap-free formula cleanses without irritation — it won’t strip skin of its natural protective oils or emollients. • Moisturizes without leaving residue that can clog pores. • Good for special skin needs including those of rosacea-prone skin. Ingredients: Water, Cetyl Alcohol, Propylene Glycol, Sodium Lauryl Sulfate, Stearyl Alcohol, Methylparaben, Propylparaben, Butylparaben. 2) Cetaphil Daily Facial Moisturizer SPF 15 (Suggested Retail: $16.99 for 4 oz. from Amazon, Drugstore.com, ULTA, Walgreens and Target): This is an ultra lightweight and fast absorbing lotion that leaves my skin soft, supple and moisturized. The fragrance-free formula is non-irritating, and has never caused my combination skin to breakout. I do, however, use an additional sunscreen since I prefer using a higher SPF on a daily basis. Under your makeup or after shaving, Cetaphil Daily Facial Moisturizer with SPF 15 is a gentle moisturizer suitable for all skin types. Daily use improves your skin's ability to retain vital moisture. Active Ingredients: Avobenzone 3%, Octocrylene 10%. Inactive Ingredients: Water, Diisopropyl Adipate, Cyclomethicone, Glycerin, Glyceryl Stearate, PEG-100 Stearate, Polymethyl Methacrylate, Phenoxyethanol, Benzyl Alcohol, Acrylates/C10-30 Alkyl Acrylate Crosspolymer, Tocopheryl Acetate, Carbomer 940, Disodium EDTA, Triethanolamine. 3) Cetaphil Cleansing Cloths (Suggested Retail: $7.49 for 25 cloths from Amazon, Drugstore.com, ULTA, Walgreens and Target): I absolutely love cleansing cloths to remove makeup, and these are probably the most gentle that I have tried. Each cloth is ultra soft and gentle against the skin, and they don't irritate my sensitive eyes in the least bit. Not only do they remove all of my makeup effortlessly, but they also leave my skin soft and moisturized– rather than stripped. Cetaphil Gentle Skin Cleansing Cloths will leave skin feeling fresh and clean - without drying out or disturbing skin's natural pH balance. Directions: Gently wipe your face including eye area to remove makeup and impurities. There is no need to rinse. Close lid securely after each use. Please dispose of used cloths in trash receptacle (do not flush). Ingredients: Water, Cetyl Alcohol, Propylene Glycol, Iodopropynyl Butylcarbamate, 2-Bromo-2-Nitropropane-1, 3-Diol, Sodium Lauryl Sulfate, Stearyl Alcohol, Methylparaben, Propylparaben, Sodium Citrate, Butylparaben, Allantoin, Zinc Gluconate. 4) Cetaphil RestoraDerm Eczema Calming Body Wash (Suggested Retail: $17.79 for 10 oz. from Amazon, Drugstore.com, ULTA, Walgreens and Target): I absolutely love this body wash! It is an ultra-gentle soap-free cleanser that has a satisfying lather. It neither strips the skin, nor does it leave behind a residue, but instead it gently and thoroughly cleanses the skin. My skin is left soft, supple and moisturized. Same eczema-soothing power, now easier to find at the shelf! Cetaphil RestoraDerm® Eczema Calming Body Wash is formulated to soothe dry, itchy skin associated with eczema and atopic dermatitis. Using advanced technology, this creamy wash gently cleanses and rinses without irritation and holds skin–nourishing oils in a gentle, soap–free cleanser. Directions: Apply to wet skin and massage into lather. Rinse and pat dry. Avoid contact with eyes. Ingredients: Water, Butyrospermum Parkii (Shea Butter), Sodium Trideceth Sulfate, Glycerin, Helianthus Annuus (Sunflower) Seed Oil, Sodium Chloride, Sodium Lauroamphoacetate, Cocamide MEA, Niacinamide, Tocopheryl Acetate, Allantoin, Arginine, Citric Acid, Methylisothiazolinone, Sodium PCA, 1, 2-Hexanediol, Caprylyl Glycol, Guar Hydroxypropyltrimonium Chloride, Potassium Sorbate, Disodium EDTA. 5) Cetaphil RestoraDerm Eczema Calming Body Moisturizer (Suggested Retail: $17.79 for 10 oz. from Amazon, Drugstore.com, ULTA, Walgreens and Target): This is a lightweight and fast absorbing moisturizer that deeply hydrates skin, and the effects last for many hours. My skin feels moisturized, soothed, soft and supple. • Soothes, replenishes and protects very dry and eczema-prone skin for long-lasting relief. • Unique combination of patented ceramide and Filaggrin technology™ that’s clinically proven to help strengthen skin’s protective layer. • Helps restore skin moisture. • Safe even for babies as young as three months. Ingredients: Water, Glycerin, Caprylic/Capric Triglyceride, Helianthus Annus (Sunflower) Seed Oil, Pentylene Glycol, Butyrospermum Parkii (Shea Butter), Sorbitol, Cyclopentasiloxane, Cetearyl Alcohol, Behenyl Alcohol, Glyceryl Stearate, Tocopheryl Acetate, Hydroxypalmitoyl Sphinganine, Niacinamide, Allantoin, Panthenol, Arginine, Disodium Ethylene Dicocamide PEG-15 Disulfate, Glyceryl Stearate Citrate, Sodium PCA, Ceteareth-20, Sodium Polyacrylate, Caprylyl Glycol, Citric Acid, Dimethiconol, Disodium EDTA, Sodium Hyaluronate, Cetyl Alcohol. Overall Assessment: This is such a gentle and effective line, and definitely worth having on hand.